A Mississippi Stereo Type. - Mississippi Believe It! Home » Resources » Campaign » A Mississippi Stereo Type. There are a lot of stereotypes in Mississippi. Our favorite “stereo type” is the one that resonates in the ears of music fans the world over. In 1965, Hartley Peavey started Peavey® Electronics in his dad’s basement in Meridian, Mississippi. From that small, one- room operation, Peavey® has grown to encompass 1.5 million square feet of manufacturing space. A leader in manufacturing mixing consoles, amplifiers, speakers, microphones, guitars, basses, keyboards … and just about anything else that has to do with music … Peavey supplies acts from rockers Ted Nugent, Lynyrd Skynyrd and Red Jumpsuit Apparatus to country stars Kenny Chesney, Tim McGraw and Hank Williams Jr. Peavey also has more patents, trademarks and registered products than anyone else in the industry. 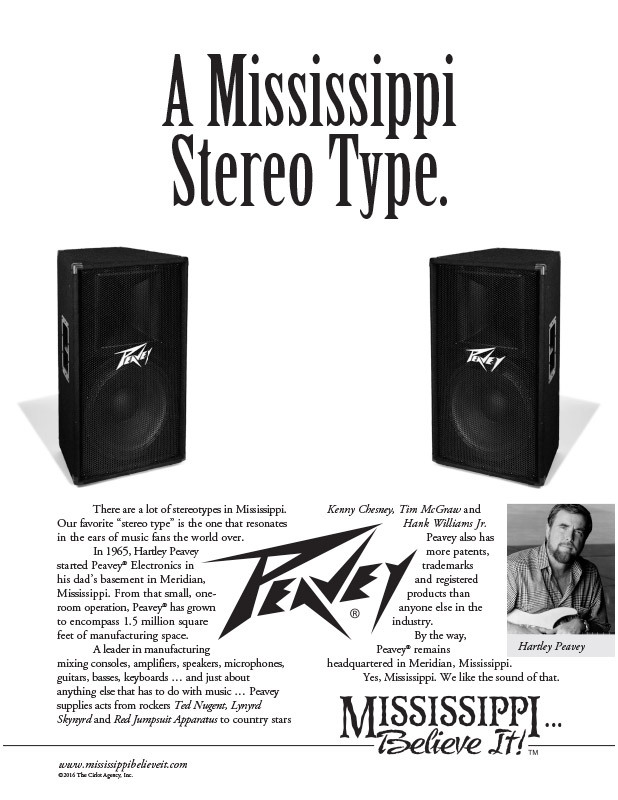 By the way, Peavey® remains headquartered in Meridian, Mississippi. Yes, Mississippi. We like the sound of that.